The US government’s Cash for Clunkers program was wildly successful, but that just means that A) a lot of new cars were sold and B) there are a lot of used cars just sitting around, waiting to be sent to the junkyard or scrapped for parts or whatever the government decided to do with their piles of old Yugos and Hondas. 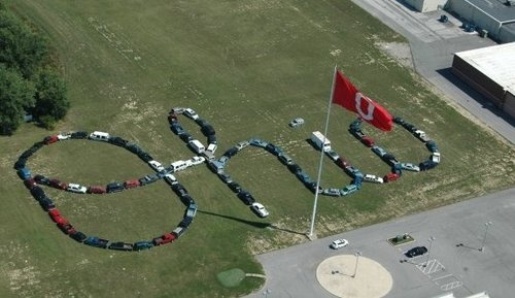 Well, Kasper Toyota in Sandusky, Ohio, decided to have a little fun with their clunkers, turning a line of old cars into a metallic version of Script Ohio. Neat, huh? For those of you not in the know, Script Ohio is the signature move of the Ohio State University marching band, wherein the band marches onto the field single-file and creates a gigantic cursive-writing Ohio, with a celebrity or someone special generally dotting the i. While I normally hate all things Ohio State, I have to admit that Script Ohio is AWESOME.